In January, while hopeful new year’s resolutioners fill gyms across the land, others stay home with their own personal “Ghosts of Broken Resolutions Past:” the dusty, still-squeaky athletic shoes they haven’t touched since January 2012. Is there any real hope for people who want to make a lifestyle change that lasts beyond a week or two? The answer is yes. Prompted by some sobering news at the doctor’s office in the summer of 2012, Penn alumni husband and wife, Steve Miller, W’96, and Lucy Ramos Miller, C’97, made a genuine commitment to improving their health. They are still going strong in 2013 despite the challenges of full time jobs (he leads business innovation for a cluster of countries in Goodyear’s Latin America operation, she is a General Magistrate at the Seventeenth Judicial Circuit Court in Ft. Lauderdale, Florida) and raising three children ages 12, 9, and 4. What are their results? Where do they get their inspiration? And, most importantly, HOW ON EARTH DO THEY DO IT? Read on to find out, because you can do it, too. 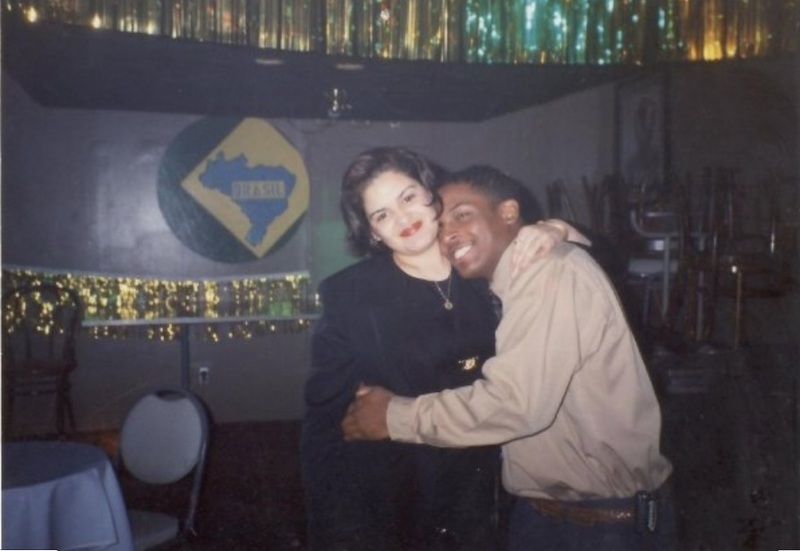 Lucy and Steve – ’90s pic from the Penn days. To what degree were you athletic or physically active in your student days? STEVE: Some of my earliest memories include playing basketball in our front yard, tackle football in the back yard, or “any bounce” baseball in the street. As a teen, I focused my efforts on my best sport, wrestling. I was recruited by Coach Roger Reina to wrestle at Penn, but I realized early in my first season that I probably didn’t have the passion to do it for 4 years. Furthermore, my body was spent, and I couldn’t imagine more years of cutting weight. I “retired” from wrestling in my freshman year. In 1994, I became very restless and, as a result, joined Penn’s sprint football team. I thoroughly enjoyed my two years with Coach Bill Wagner and the team. LUCY: I was never really active growing up. I played basketball and volleyball from grade school through high school, but that was really it. In college and graduate school, I always had lofty “plans” of becoming more active, but those plans never really came to fruition. Once I started my post graduate career, I no longer even had plans. What prompted you to take on a fitness program? STEVE: I’ve always tried to be active. After graduating from Penn, I played summer league baseball in Cleveland. I’ve played flag football sporadically for years. In 2006, while living in Jamaica, Lucy and I joined a running club in Kingston. We met some wonderful people through the group and learned a lot about distance running. 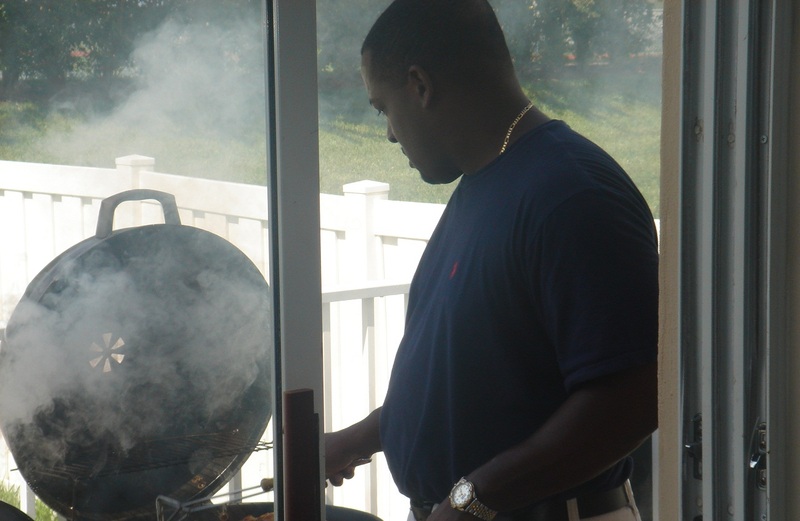 However, after leaving Jamaica in 2008, I didn’t keep a consistent, organized workout regimen. At the end of 2011, I ran my first mud race. I started mud running because it looked fun. They seemed to be the perfect mix of short distance running and challenging obstacles. This seemed well-suited for my attention span. LUCY: Sometime after relocating to Kingston, Jamaica in 2006, Steve and I decided to become more active. We started doing some distance running with the goal of running a half marathon. However, at that time we still weren’t completely committed and I became pregnant with our third child. 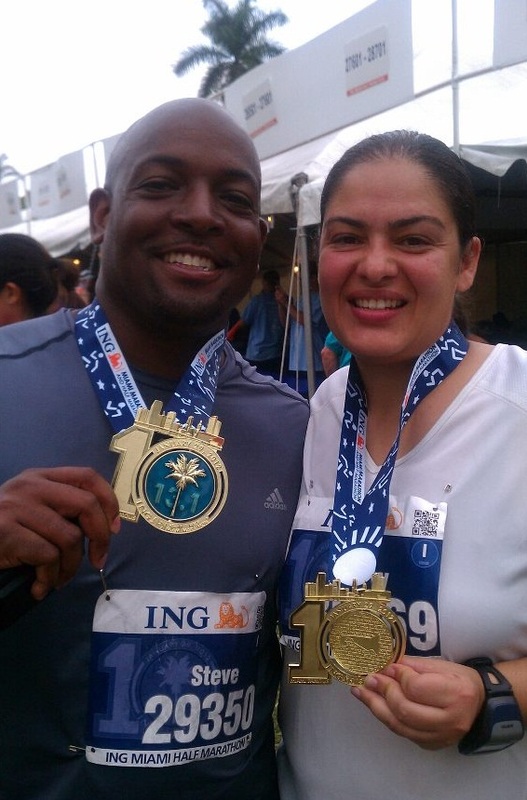 Shortly after relocating from Kingston to Miami in late 2008 and delivering our third child, Steve and I began to revisit the half marathon goal. For me personally, I needed to shed the additional pregnancy weight, and I wanted to accomplish something physically that I never thought that I could do. In January 2012, Steve and I ran our first half marathon together. What sparked your renewed commitment to fitness in summer 2012? STEVE: For years, my HDL cholesterol level was too low. My doctor wanted to prescribe niacin to help improve my levels. He gave me the option of making a lifestyle adjustment or taking medication, but he stressed to me that two-thirds of my HDL level was genetic, so there was limit to how much I could change that with lifestyle alterations. I knew I would likely have to go on niacin, but I wanted to give 100% toward lifestyle changes to see how close I could get to the target. I needed to know, empirically, how much control I really had to influence the outcome. I asked him to give me 90 days to improve my numbers. LUCY: After completing the half marathon, I took a period of time off from training with the idea of allowing my body to rest. However, as time passed I seemed to have lost the motivation to train for distance running. In June 2012, Steve and I both had annual routine physicals done. We both had some cholesterol issues and were threatened to be placed on medication to manage them. My triglyceride level was very high. Additionally, I was labeled as “clinically obese.” Wanting to avoid medication and ensure that we’d be around to watch our children grow, Steve and I decided we *had* to start and stick with a fitness. How did you choose the right program for you? STEVE: It was accidental. I had watched the CrossFit games on ESPN and thought it was interesting, but I never seriously considered starting CrossFit. However, a few folks from my office joined and really talked it up. When my doctor told me I needed to exercise with greater intensity, I immediately thought of CrossFit. The icing on the cake was when I realized a location opened less than 5 minutes from home. I signed up in June 2012. LUCY: Steve loved CrossFit and encouraged me to try it as well. So in July 2012, I did and, like Steve, I loved it! I made a promise to commit to it for two months to see if I still liked it. I am now in my sixth month. I love it because it is varied, intense, and incorporates both cardiovascular and weight training. I realized that I need a program that simply requires me to show up and do as I am instructed. I tend not to stick with programs that require me to plan and create workouts. I also don’t have a lot of time to commit, so I need an intense workout in a condensed amount of time, and one that will maintain my interest. I get bored with workouts that repeat the same routine. STEVE: Quantitative – within 90 days, my HDL (mg/dl) increased from 36 to 44. My triglyceride level decreased from 197 to 121. I’ve lost 20 pounds while also gaining muscle. Dropped 2 sizes in pants. I’ve worn XL casual shirts since my days at Penn. I’m now uncomfortable in XL and prefer a large. LUCY: After just three short months, my triglyceride level improved from 256 to 106. 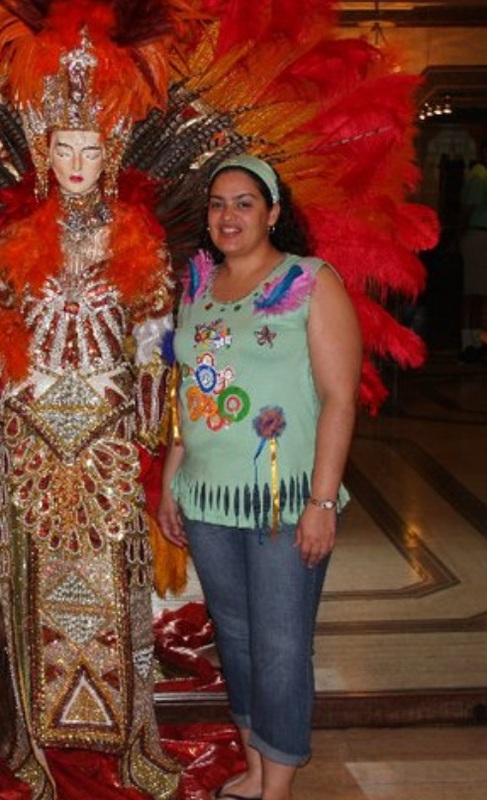 I had also lost approximately 20 lbs. and three dress sizes. I have gained muscle mass and am stronger than I have ever been. STEVE: Sprint 400 meters without passing out. 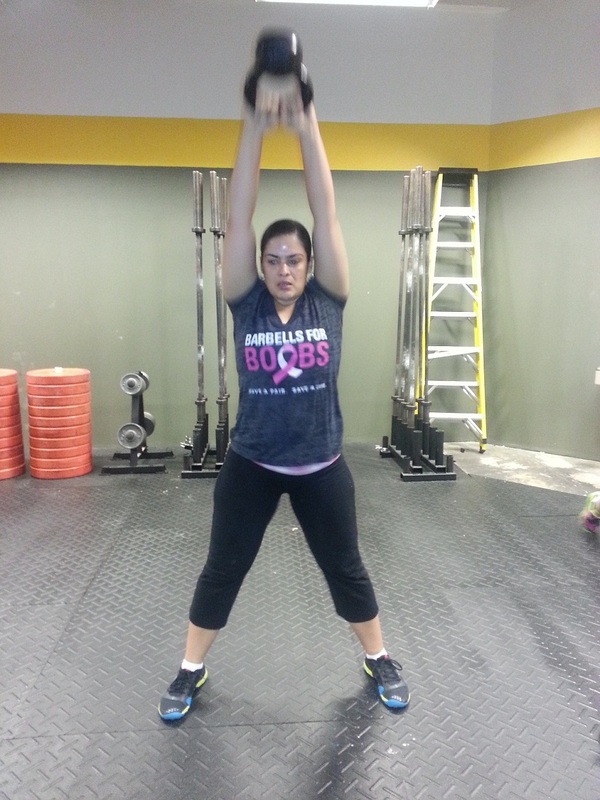 LUCY: When I began CrossFit I could not do a box jump. Box jumps are when you jump onto the top of a box. I could not do a single jump onto the smallest box, which is 12 inches in height. I can now do box jumps on a 20 inch box. There are other examples, but this is the classic example for me. Describe your proudest accomplishment since starting on this path. STEVE: Competing in my first CrossFit competition in December. It was an important milestone. I was also proud to compete (and hold my own) against competitors half my age. LUCY: Aside from achieving weight loss, my proudest accomplishment has been doing things (physically) that I never imagined I’d ever be able to do. Steve, “after,” 2012 Color Run. What has been the most challenging part of this journey? STEVE: In the past, Lucy and I wouldn’t be on the same page. We preferred different workouts and different diet strategies. Of course, having two different tactical approaches is a burden and it sharply diminishes the probability for success for each of us. Now we are both on the same page. We speak the same language. We talk about our workouts. We empathize more. This has helped us stick with it. LUCY: The most challenging part has and continues to be frustration with the rate of progress. Too often we are driven by instant gratification, and when we don’t get instant gratification we tend to quit the program. I have to constantly remind myself that slow/small progress is still progress! How have others responded to this undertaking? STEVE: Very positive feedback. I think people respect the process as well as the results. With this program, there aren’t any shortcuts. It requires hard work. As such, people seem to respond favorably to what we’ve been able to accomplish. LUCY: Initially my family and friends thought that my goals were lofty and the fitness program insane. Many doubted that I would remain committed to the program. However, all of my friends and family are amazed with the outward physical results. When I inform them of the internal physical results, they are in disbelief. They now encourage me to stay committed to this lifestyle are some have even expressed motivation to start a program of their own. You have three children, and you each have a full-time job. How, and why, do you maintain your commitment to exercise? STEVE: Since health is my primary motivator, I’m not willing to accept the alternative. Although we have time constraints and competing priorities, it’s imperative that we make room for our fitness requirements. Plus, I’m a strong believer that kids do what they see every day. Creating a healthy lifestyle for our family is incredibly important. Family heirlooms aren’t always physical objects. LUCY: Steve and I are both committed to maintaining the lifestyle changes that we’ve implemented. We include exercise into our daily routine just like any other activity that must be done on a daily basis such as going to work. We work together and coordinate schedules to ensure that we are each able to get our workouts in. We are also accountable to one another so that neither falls off of the wagon too much. How has this endeavor effected the way you raise your children? STEVE: We have transitioned from a “Dad thing” to a “Mom and Dad thing,” to a “Miller family thing.” Our kids are truly excited about participating in the same activities. In fact, Sidney, or younger daughter, listed “run more races with Mom and Dad” on her Christmas wish list. I think we’re on the right path. LUCY: We have altered the way we eat and are teaching our children how to make good food choices. We also encourage them to live active lifestyles. To that end, we encourage the kids to play intramural sports, we encourage them to join us in 5k races, and we have even enrolled them in CrossFit for kids! The children really seem to have embraced these lifestyle changes and understand that the motivation behind them is healthy living. 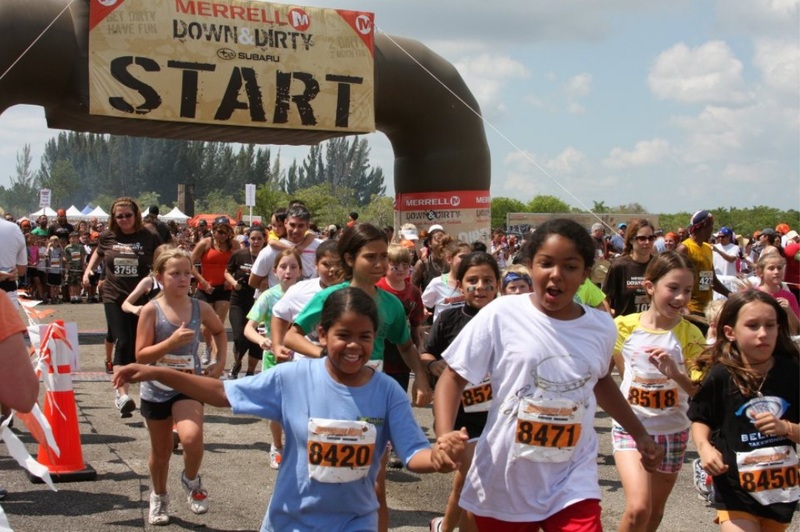 Daughters Sidney (9) and Sam (12) starting a mud run. Son Nicholas (4) participates in CrossFit Kids with his big sisters. STEVE: My original goal was to improve my body chemistry. I’ve done that. Looking forward, I want to continue to do that and get stronger as an athlete while helping others accomplish big goals. LUCY: My original goal was simply a fifty pound weight loss goal. By that measure, I have another twenty lbs. to go. However, as time passed I realized that the number on the scale is much less important than how I look and feel. I have lost three dress sizes. I would love to lose another dress size. If I lost another twenty pounds I’d be happy, but my size and shape are much more important to me than my actual weight. 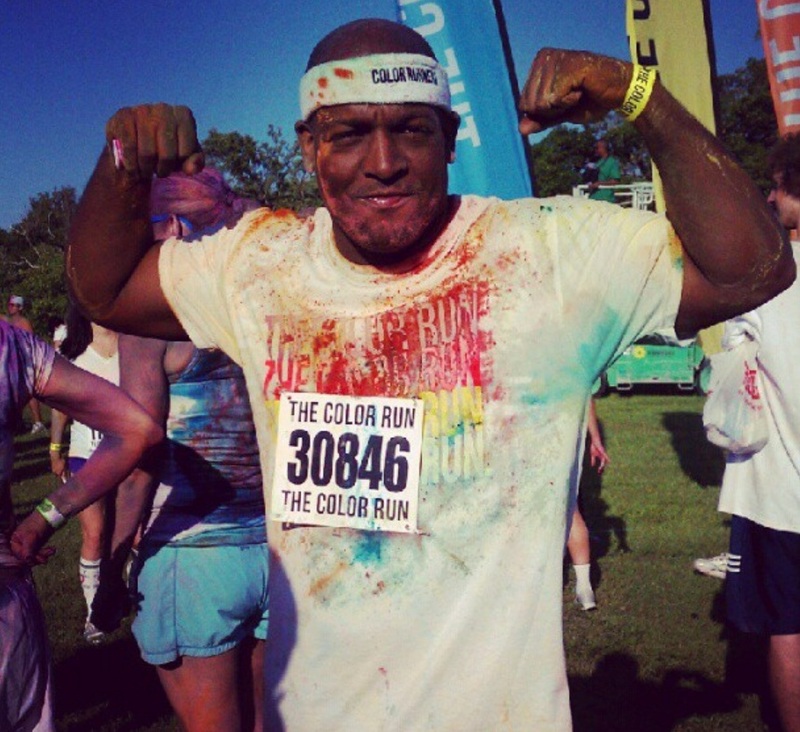 How has your dedication to your fitness goals affected other areas of your life? STEVE: For me, it has rekindled a passion for teaching and helping people reach their respective goals. Most of the hours I spend at the CrossFit box are dedicated to helping folks get better and stronger. I thoroughly enjoy being a cheerleader there, and that skill has helped me be a better cheerleader in the workplace as well. LUCY: I have noticed an improved self-confidence socially and professionally. What advice would you offer to those *without* a workout partner who want to take on a similar challenge? STEVE: First of all, although having a partner helps, don’t use that as an excuse to sit on the couch. Even if you have to start as a solo act, get moving. Second, think about group classes or exercise clubs that usually bring together people at a variety of skill levels. They help create an ecosystem – a distinct subculture – that provides friendships, support, and best practices, and will improve your chances of success. LUCY: I would encourage you to start off at a program where you have other members that can serve as sources of support. Other members of a box/gym can serve as your partner. You can likely find someone to workout with, but they can also be a source for support and motivation. Making these kinds of permanent lifestyle changes is difficult to do on your own. You will need a support system of some kind. 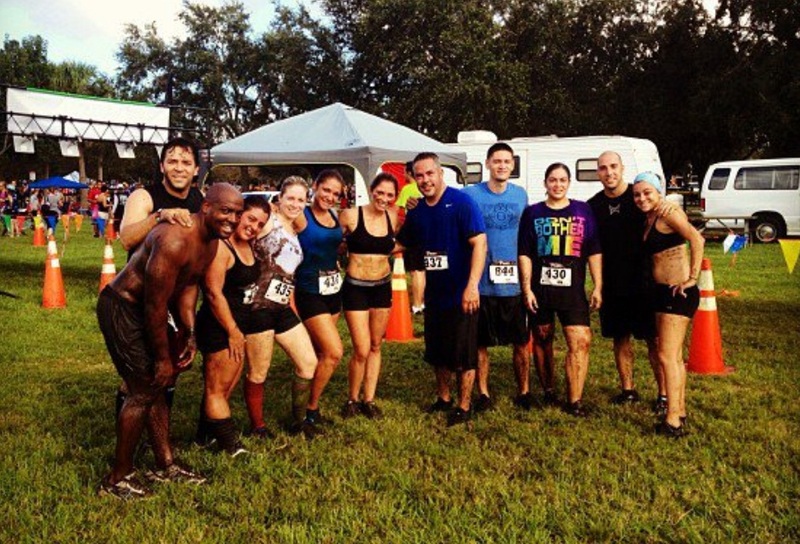 Steve (far left, shirtless) & Lucy (in “Don’t Bother Me” shirt) in the 2012 Mud Run with part of their CrossFit Siege family. Many people start programs and don’t stick with them, but you are both still at it. Why? STEVE: I thoroughly enjoy what I’m doing. That wasn’t always the case. Although I enjoyed the camaraderie of my running group, I’m not very enthusiastic about running. It is a chore to train. Even though I accomplished a few significant milestones, I always loathed the training. Today, I love running through mud and jumping over fire. I enjoy the challenge and variability of my workouts. Making fitness fun is a key component to sustainable success. LUCY: I have had to change the way I think about my fitness goals. I have had to retrain my brain to think of fitness as a permanent lifestyle change as opposed to a short term fitness goal. Doing this has forced me accept that this is a necessity in my life. And honestly, witnessing Steve maintaining his commitment and resolve gives me the strength and motivation to maintain mine. What words of wisdom do you have for the person reading this who is seriously thinking about taking on his or her fitness goals? STEVE: Think about sustainable lifestyle changes. Also, think about establishing your finish line some place beyond a dress size or some magical number on the scale. LUCY: Stop thinking about it, and do it! There is no better time than the present. Don’t wait for January, or Monday, or after vacation, etc. The day is today, and the time is now. The other piece of advice that I would offer is to break down the ultimate goal into stages or smaller goals. Doing this not only makes the goal appear less far reaching and daunting, but accomplishing the smaller goals will also give you the confidence and motivation to work toward the next goal/stage. Steve and Lucy one year ago, in January 2012, after completing their first half-marathon. Special thanks to Steve and Lucy for taking the time to answer these questions. I know they join me in cheering you on, reader, if you are considering new health and fitness goals in 2013 because, as mentioned, you can do it, too. So, without further ado, take your mark… get set… go. Filed under Alumni Perspective, Alumni Profile, Nicole M.
A very impressive and encouraging story to get me motivated for 2013. Thanks! Michael, I’m so glad that you find Steve and Lucy to be as inspiring as I do. Thanks for letting us know. I’ll make sure they see your comment! Best wishes to you as you move towards your goals in 2013.